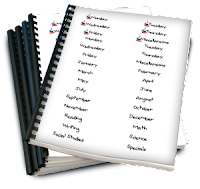 Classroom Freebies Too: Weekly Planning Organization! I start by going through my lesson plans, and start running any copies I need or manipulatives and placing them in the appropriate day folder. My lesson plan crate was kept on a table, counter top, or has even been located on an extra student desk that was shoved against a wall. Inside, I place hanging files and matching file folders in whatever color scheme or theme you choose. Then, I place labels for each day of the week on my file folders. Want your own set of organization labels?